Have a plan of action so you'll be happy now...and later! I don't know about you, but I've been seeing black kitchen cabinets pop up everywhere I look lately. It has been a strong trend for about four years now, but it has gotten to the point that it's showing up in mainstream products. Which probably means that it will burn bright and then fizzle out in the next five years. What I'd like to tell you is that I'd love it if black sticks around for a while. Honestly, I'm hoping that it's going to have some staying power because it's such a lovely foil to the most classic color of all times...white. It adds depth to any room it's in and looks fantastic with lots of different wood tones. However, the "wall to wall" black kitchen cabinet look that is so popular now, will not last. In ten years, we will walk into a kitchen like that and know which decade it came from. I'm not trying to discourage you if this is your jam. I absolutely love what I'm seeing (perhaps that's because, as a kitchen designer, we tend to get a little burnout on the "white kitchen" thing), I just want to make sure you consider your investment and make sure you're prepared for the ramifications. You need a plan of action to implement this trend that meshes well with your wallet and your sensibilities! Source: reDesign Home LLC. A lovely example of the black and white kitchen trend. Crisp white shiplap walls, black cabinetry, white marble and distressed wood as accents. There is no doubt about it, we are bolder in our choices now than we used to be in the last decade. We are more educated about style and options than any other generation that has come before us. It has been a general rule of thumb in the design industry for as long as I can remember that trends in kitchen and bathroom design will date the project about every ten years. So if you pick that trendy shaped tile or the material of the moment (encaustic tiles anyone? ), for your bathroom renovation, then you'd better make a plan to move a few years before you hit the ten year mark. Otherwise, you'll be too late. If you stick around for ten years, then you'd better plan on coughing up big $$ so that someone else can move into your home and enjoy the fruits of your labor. However, we move so fast now, don't we? I heard someone speaking about the generational shifts that are occurring in our society and how it used to be that a major change in the way a particular generation thinks and acts from the one before it occurred about every twenty years. This is why its so hard to connect with those from one of the "other" generations. This speaker then went on to say that those generational shifts in our thinking are now occurring every seven years! That will have an implication on everything we do and the way companies must try to specialize and narrow down their target audiences. After all, they can't be everything to everyone, right? Restaurants, schools, stores...they will all have to figure out how to market their next big thing without alienating those who have shown loyalty in the past. So that brings up the obvious point to this post, and that is that design trends will inevitably start to turn over much more quickly now than ever before. Perhaps you already believe that they do. How will that impact our lives? Most of us can't afford to throw away our time or money on things that are only going to have a lifespan of a few years. The luxury market has always been reticent to follow the trends. It's not that the wealthy are worried about throwing their money away on a trend - it's that time is often their most valuable asset and they can't afford to rip things out and do them over all of the time. Therefore, it seems to me that a return to the classics is in the making. So here is my take on this black kitchen cabinet trend. Using black cabinetry throughout the whole kitchen is a trend and it is going to date like pretty much every other trend. However, I think there are lots of ways you can still strategically approach this if you really love it and want to incorporate it into your space. 1) LOOK FOR WAYS IN WHICH IT CAN BE ALTERED IN THE FUTURE WHEN IT STARTS TO DATE. On-site painted cabinetry. I've always been a fan of on-site painted cabinetry. Oddly enough, the higher-end brands of British cabinetry that I work with all employ this concept. There is something magical about that hand-painted English kitchen look. When cabinetry is painted on-site, it has a more touchable, soft, and textured feel that is highly desirable and adds to the bespoke nature of a luxury kitchen. Factory finishes, in contrast, have a more plastic feel to them, similar to melamine. Factory painted finishes are admittedly more durable, so that's definitely a consideration. However, I've been designing with hand-painted cabinetry for almost twenty years now and I've never had a client regret it or complain about it. 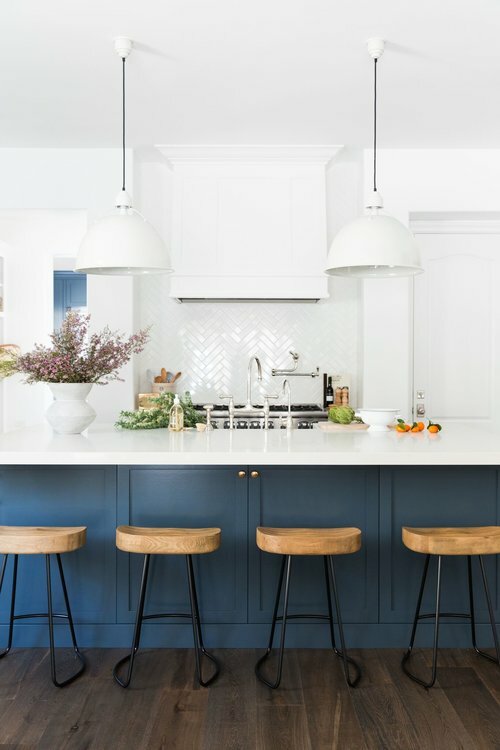 By the time the cabinetry is needing a fresh coat of paint, most people would probably be ready to update the color a bit anyhow (unless you're choosing a crisp white, which is timeless). 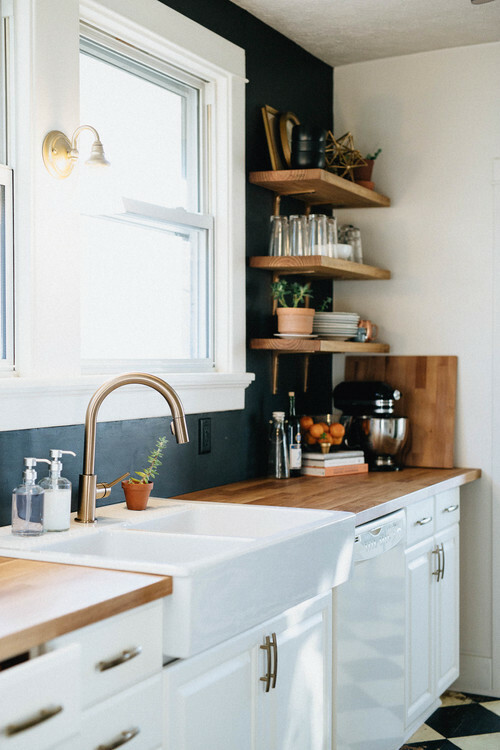 If you can satisfy your craving for black painted cabinetry in such a way that you can paint it a different color down the road, then you've got a plan worth considering. Remember to keep that in mind as you select your countertop materials, backsplash, etc. If this is your plan of action, you'll want to make sure that your other material selections will work well with another color of cabinetry down the road. Paint the walls instead of the cabinetry. 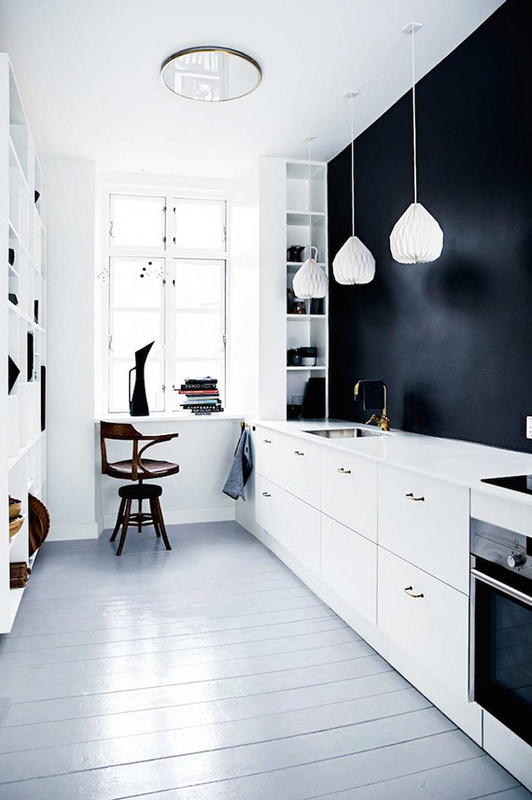 Knowing that this was a trend that wouldn't last forever, these folks were very clever and got the black and white kitchen trend by putting black on the walls while keeping the cabinetry white. Walls are arguably lots easier to paint than cabinetry. If I was going to interpret this trend for a client with a modern farmhouse kitchen, this is how I would envision it...with wide, vertical v-groove planks on the walls (more timeless than horizontal shiplap) that would be painted black, combined with crisp white cabinetry and a few distressed wood elements that could be ditched later on...like floating shelves. 2) INCORPORATE THE TREND IN A NON-TRENDY WAY. There are lots of ways to incorporate black into your design. The kitchens that date the least are often ones that really march to the beat of their own drummer. Take the black and white kitchen (below). They've used the same combination of crisp white, black, and wood tones, so it looks totally on trend, but all of these elements are totally classic. The black La Cornue CornuFe looks fabulous against the white Calacatta marble and the white cabinetry. 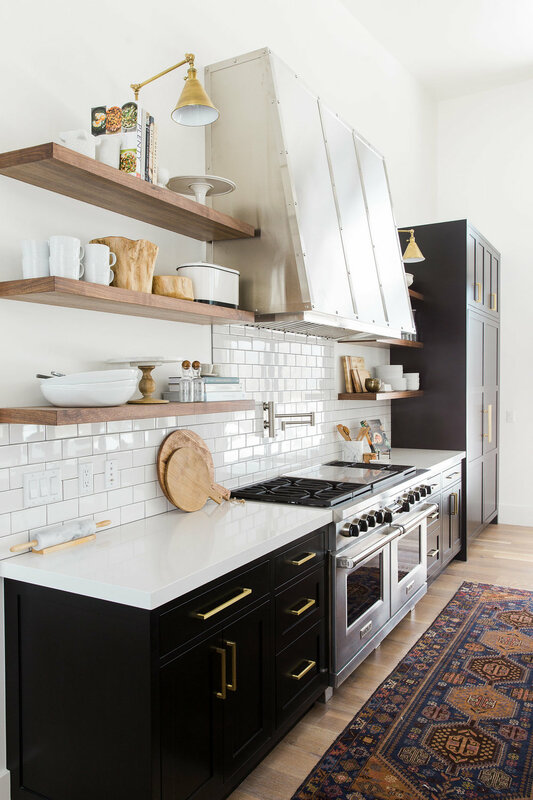 Source: Terra Cotta Design Build Co.
Or this one (below)...who did a similar thing, but used the black on the metal range hood, the backsplash tile, and the pendant lights. The hood is classic. The tile looks fantastic now but will be dated eventually. However, the designer cleverly used it on only one wall, so it will be a fairly easy update when the time comes. 3) LIMIT THE SCOPE OF IT. The best case scenario for longevity would be to use it on the island only. The second best scenario would be to use it on the lower cabinetry only. While some of you out there may love this look for twenty years, you should still do yourself a favor and at least mentally prepare to re-paint it in ten years or less, especially if re-selling your home around that time. 4) TRY THE DARK TREND WITH ANOTHER COLOR THAT IS A LITTLE LESS "COLOUR DU JOUR." Again, it will have more staying power if you go in your own direction and do something a little less trendy. Make your cabinetry color something that reflects the colors in your overall home and, of course, a color that you love. 5) BE CAREFUL NOT TO COMBINE IT WITH TOO MANY OTHER ON-TREND IDEAS AT THE SAME TIME, SUCH AS LIGHT WOOD FINISHES, TRENDY TILES, ETC. These kitchens combine several trendy elements, which will call for big updates when they have all run their course. Again, the kitchens (below) are beautiful. Absolutely stunning and made for this Instagram world we live in. I have pinned all sorts of kitchens like these to my Pinterest board "Kitchen Design Inspiration." Keep in mind, though, that these homeowners may be super on-trend people who will call their favorite designer up to re-do their kitchen every ten years and not bat an eyelash. If you are not one of those people, then be more strategic with your selections. If you love the warmth of traditional kitchens but have also found yourself craving clean lines and simplicity, then this is the year for you! Kitchen trends in 2019 will be all about that masterful mix that we call the New Traditional. It’s no mystery why Americans are enamored with English kitchens. Having a bespoke, bench-made, English kitchen is still the ultimate luxury item for high-end homes. So, if you’re interested in bringing a bit of authenticity into your kitchen design, then consider this a recipe for your success. I’ve always felt that rooms “talk” to us. They tell us what they want to be. In this project reveal, I’m going to show you how I used a quirky feature of this room to create a double island kitchen which solved a major problem with the home’s layout. Are you eating, sleeping, and dreaming all things kitchen design related? Planning a new kitchen or a remodel can be pretty exhausting, but we all know it’s worth it! Great design lives in the amazing little details that we incorporate into our kitchens. So in this three part series about kitchen cabinet details, I’m kicking it off by taking a look at interesting interior ideas for your cabinetry. Looking for the most amazing products for your kitchen or bath? I've curated a library of my favorite resources (that I use for my very own clients)...and i'm sharing it with you! Thank you! Please find the link to my private resource guide below. You’ll also receive this link via email, so be sure to save that email so you’ll always have access to my library. I update it from time to time when I discover cool new brands!